This onion thyme tart is a cinch to make: frozen puff pastry, yellow onions, thyme, olive oil, and salt. Bingo. Dinner’s done. 1. Heat the olive oil in a large sauté pan over medium heat. Add the onions and stir continuously until softened, 8 to 10 minutes. Sprinkle in the salt and continue stirring until the onions release their moisture and the pan becomes more and more dry. When this happens, add half of the thyme and reduce the heat to medium low. Cook the onions, stirring occasionally, until caramelized and golden, 30 to 40 minutes or so. (If the onions start to brown, reduce the heat as low as your stove goes.) Remove from the heat and set aside. Onion Thyme Tart Recipe © 2010 Amy Pennington. Photo © 2010 Della Chen. All rights reserved. All recipes and photos used with permission of the publisher. I love this recipe (and Amy Pennington’s entire cookbook for that matter!) for its simplicity and visual beauty. 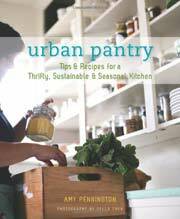 The charm of this recipe and the cookbook is in having a pantry stocked with basic ingredients at all times, so you can easily throw together delicious and healthful meals any day of the week. In terms of the recipe itself, I used seven sprigs of thyme (the more the merrier, in my opinion) and I cooked the onions on medium low for 30, not 40, minutes. When I arranged the puff pastry on the baking sheet, I did not roll it out, and I did not leave a border in terms of the onions touching the sides. This seemed to work very well. The crust puffed up and lightly browned and onions were a nice golden, caramelized color when all was said and done. We served it with a nice pea, feta, and crisped prosciutto salad to round out the meal. This simple recipe was a hit, and I will definitely be making it again very soon, no matter what the season. Simplicity at its best. Loved the final sweet taste and the crispness of the dough. Even the kids totally loved it and wanted more. A perfect appetizer or snack. This is very simple and straightforward—and almost all the ingredients you can find in your freezer or pantry. Since this is puff pastry, be sure that the dough remains cold for as long as possible—this way the pastry will puff up and be crisp. The caramelized onions will take quite a while to prepare, so keep this in mind, but the results will be well worth it when topped with arugula and served with a glass of white wine. Exceedingly reminiscent of a pissalidière, but without the anchovies and olives. A very simple recipe that doesn’t require much active time, but one that yields excellent results. I cut it in small squares and served it as an hors d’oeuvre for a cocktail party. The recipe is straightforward and works just as written. I used yellow Vidalias, since they are in season now and are the best onions we can get in the market. I used homemade puff pastry, since it’s so much cheaper than store-bought, and I have a wonderfully easy recipe I’ve had for several years from a friend. These were delicious after the 10-minute wait after removing them from the oven and also delicious at room temperature. They would make a great addition to an appetizer menu, but also make a great lunch, which is how my daughter and I devoured them. I will be making these again. I could not stop eating this tart! It was so delicious with a chilled tomato soup I served for lunch. Very easy recipe, and it’s a great make-ahead item, as it reheats beautifully and quickly in the oven. Use kitchen shears to cut the tart into squares! It is less messy to cut a flaky pastry this way. I did use a very high-quality puff pastry (Dufour) to make this recipe. I would recommend that the onions be cooked to just golden brown (if that) in the pan, as they really take on quite a bit of color when they go in the oven for 25 minutes, especially with the additional fat in the puff pastry dough. A good deal of the onions in my test tart blackened and burned. They were just on the edge of being too acrid and bitter to eat. The combination of onions, olive oil, thyme, and puff pastry delivers all that the author promises. The recipe works beautifully as written, but also would be forgiving if, say, you had only one onion in the pantry or only a couple of thyme sprigs in the refrigerator (or garden, if you are lucky). The only slight change I made was not chopping the thyme leaves — they were pretty tiny right off the stems. The stated yield could easily be enjoyed by just three or four people, so you might want to double the recipe (and use both puff pastry sheets in the box as well as more of the packaged thyme sprigs). All who tasted this at my table loved it. This will be my new go-to appetizer! Super easy and very tasty. Try to find frozen puff pastry made with butter and it will be even better. Its very simple flavors give even novice cooks the opportunity for that personal touch — add a bit of crumbled goat cheese or blue cheese during the last five minutes, add a bit of crispy bacon or prosciutto while it cools. Also, a slight sprinkle of a nice sea salt adds a sophisticated touch. This is a very easy way to prepare a dish which reminded us of the wonderful tastes and views of Provence region in the south of France. 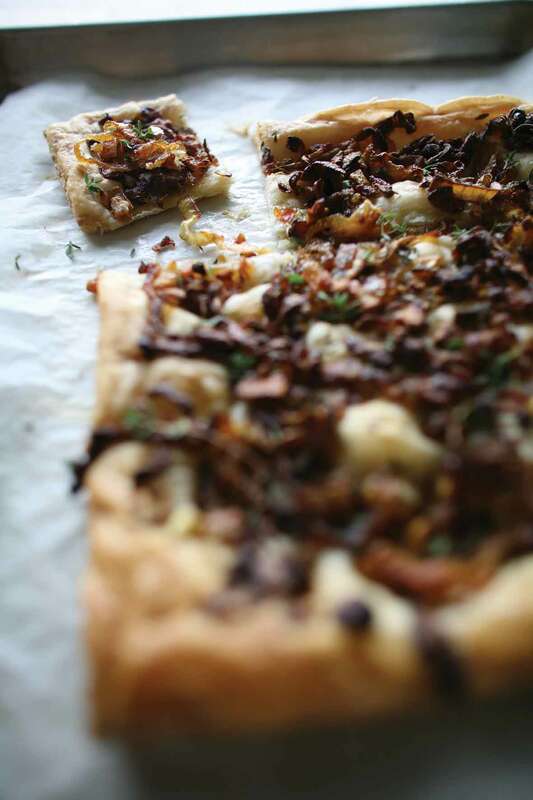 One of their specialties is the pissalidière, the onion pizza. We love it very much, but it needs to be made ahead of time, while this recipe is a little shorter and tastes different because of the puff pastry. We loved this version very much and I already prepared it twice. For some of us, it needed some more onions. I had a little problem because we live outside the US and didn’t know how much “one sheet frozen puff pastry” is. With some help from LC, I learned it’s about 250 grams. I have another secret shortcut to share, a tip that can make it even easier and faster to prepare. I take about 10 onions and cook them until they are caramelized as written in the recipe then put them, flat, in five Ziploc bags in the freezer. It’s always there when you need it, the kitchen is clean and it saves energy. Thanks for the recipe and the good idea, for me it’s a keeper. The flavors are great. The stove time could definitely be reduced. To get a great puff, the oven temperature should be 400° – 425°. Check the package. I used my own homemade puff pastry, and 400 worked well. (I used two squares and baked at 350° and 400°. In the past, 400° to 425° tends to work for Pepperidge Farm puff, and also for the gourmet brand found at Whole Foods.) Sometimes if you use 350°, then the puff will not puff up. You’d end up with a far denser result. This tart was delicious and could not have been easier to make. My yellow onions came in different sizes and all were a bit small, so I used more than the recipe called for. Slightly over 1 1/2 pounds of them yielded just enough caramelized onions to cover the puff pastry sheet. I’m sure red or white onions would work just fine, if that’s what you happen to have on hand. Although caramelizing onions takes a while, the good news is that they freeze well. You can caramelize a lot of onions at once in a large pot, divide them into bags, and keep them in the freezer for quite some time. While this is more of an embellished bread than a tart to me, whatever it’s called, it will be a wonderful sidekick to almost any meal. Soups, salads, eggs, roast chicken, or just some cheese and sliced apples, add this rustic bread and you’ve got a simple but elegant meal. And it’s a recipe that after you make it once, you can easily impress your friends by making it from memory. It does take a bit of time to make, but once you slice the onions, caramelizing them is easily done while accomplishing other kitchen tasks. A pizza cutter made slicing it into small squares easier than with a knife. I didn’t have time to make pastry for this recipe nor time to drive over an hour away to get a butter-based frozen pastry, but it was still very good with the widely-available variety that uses shortening. It will be even better with a butter pastry, I’m sure. The thyme sprigs I used were quite short, at around 4 inches long, and after removing the leaves from the stems, I had only about 2 teaspoons of leaves. Not nearly enough, for my taste. When I make this next time I will double the amount of thyme used. Another addition I might make is to add a splash of sherry or balsamic vinegar to the onions when they are nearly done. Some crumbled blue cheese added when the tart comes out of the oven will also be a likely addition to try. This is an easy, flavorful appetizer or accompaniment for a first course. There is one major change required to obtain good results—raise the oven temperature OR bake longer. I advise the hotter oven to ensure the puff pastry does its stuff and PUFFS. Bake puff pastry at a high temperature for a short time, usually at 400° for about 20 minutes. When the pastry is high and golden brown, it is done. But other chefs bake the pastry at 350° for almost an hour to ensure that every layer is dried and crisp. Height and color are also measures of doneness. Once you adjust the oven temperature as I did to 400°, the pastry cooked in the allotted time. At 350° you will find that the pastry will still be only partially cooked and there will be minimal puffing. You can continue to bake it longer at 350°. I did not go this route, so I can’t give you any tips about how much longer you will need to wait to taste this “tart.” Hmm..”tart” isn’t exactly the word I would use to describe this free-form puff pastry item, but hey, linguistic differences aside, this is an appetizing treat when baked correctly! We all liked this tart, as I suspected we would from the simple ingredient list. It was flaky, fragrant, and satisfying. Thyme and caramelized anything is a wonderful combination. Set on pastry that shatters with each bite made it that much more delightful. Puff dough sheets vary and calling for one sheet to make one tart gives no indication of how big the tart will be or how many servings it might yield. I had some homemade all-butter pastry on hand and used a 10-by-15-inch piece, which is the Pepperidge Farm size sheet. Dufour is an all-butter brand, but it isn’t available everywhere, and I believe the size is different. Next, I figured, correctly, that I could caramelize twice as many onions in the same amount of time because two onions seemed like they’d cook down to pretty much nothing. In fact, I caramelized 5 onions, and good thing, too. I used most of what I had, since when I scattered the recommended amount on top of my dough, it looked mighty skimpy. So simple to prepare and everyone will love it—and it can be altered in many different ways. Very recommended! This simple little recipe is just perfect for throwing together as a light meal during the holiday season. I’m a great fan of shortcuts in my cooking (I’m really quite lazy) and this dish lends itself to any number of them. Onions can be brilliantly caramelized in a slow cooker, giving the cook the chance to cook up a huge amount of them and freeze them in portions for later use. There is some absolutely beautiful frozen butter puff pastry available here in Australia, meaning that it can be kept on hand for use with short notice when people drop in unannounced. And, finally, this tart can be adapted a zillion ways to make it as simple or classy as ones pantry or imagination allows. Doesn’t really get much better, does it? Nope, Amanda, it doesn’t get any better. Many thanks for the handy shortcuts…! Yet another great reason to whip up a batch of homemade puff pastry! I have actually been craving an Onion Tart so this is perfect! Delicious in all of its simplicity! Glad you liked it, natasha.